Difference between Responsive and Adaptive web design? The rapid spread of mobile devices has turned the world of web design upside down. Users no longer view web content only on traditional desktop systems, but are increasingly using smartphones, tablets, and other devices with a wide range of dimensions. The challenge for web designers is to ensure that their websites look good not only on a big screen, but also on a tiny phone and everything in between. Media queries are an excellent way to deliver different styles to different devices, providing the best experience for each type of user. A part of the CSS3 specification, media queries expand the role of the media attribute that controls how your styles are applied. For example, it's been common practice for years to use a separate style sheet for printing web pages by specifying media="print" . Media queries take this idea to the next level by allowing designers to target styles based on a number of device properties, such as screen width, orientation, and so on. The hot topic for web developers and website owners is the way that websites can now automatically respond and adapt to any device with any screen size. This new way of web design optimizes the layout of the site to suit the screen size of the device it is being viewed on. There are two ways in which this can be achieve: with Responsive Web Design (RWD) and with Adaptive Web Design (AWD). Visitors to your site will not be concerned about which of the two methods you have used. This can simply come down to your or your designer’s preference. The user will not really notice a visible difference between the two methods but they do differ slightly.Adaptive is bit time consuming and expensive because you have to design multiple page layouts and render them according to device which renders it. The key and important tool or elements that make up a Responsive website are CSS3, media queries, the @media rule, and fluid grids that use percentages to create a flexible foundation. It is also fundamental to use flexible images, flexible videos, fluid type and EM’s instead of pixels. All of these key points allow the responsive website to modify its layout to suit the device. Truth is that Web started with only webpages. We never thought that there can be anything apart from computers which will access the web page.Simple,We were not ready for other devices,When suddenly use of mobile devices to browse the web increased ,nothing was visible on small devices properly web isn't optimized for those mobile devices. Mobile devices are often constrained by display size and require a different approach to render data on screen. Let us start thinking about how to optimize our existing or new web for mobile devices..
First and foremost thing is to use VIEWPORT TAG . 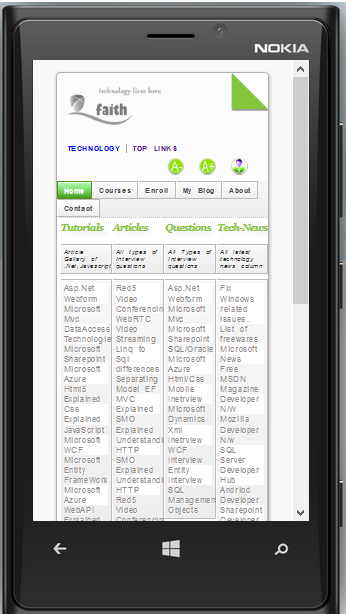 Pages optimized for a variety of devices must include a meta viewport element in the head of the document. A meta viewport tag gives the browser instructions on how to control the page’s dimensions and scaling. In order to attempt to provide the best experience, mobile browsers will render the page at a desktop screen width (usually about 980px, though this varies across devices), and then try to make the content look better by increasing font sizes and scaling the content to fit the screen. For users, this means that font sizes may appear inconsistently and they have to double-tap or pinch-zoom in order to be able to see and interact with the content. Some browsers will keep the page’s width constant when rotating to landscape mode, and zoom rather than reflow to fill the screen. Adding the attribute initial-scale=1 instructs browsers to establish a 1:1 relationship between CSS pixels and device independent pixels regardless of device orientation, and allows the page to take advantage of the full landscape width. In addition to setting an initial-scale, you can also set the minimum-scale, maximum-scale and user-scalable attributes on the viewport. When set, these can disable the user’s ability to zoom the viewport, potentially causing accessibility issues. On both desktop and mobile devices, users are used to scrolling websites vertically but not horizontally, and forcing the user to scroll horizontally or to zoom out in order to see the whole page results in a poor user experience. Use meta viewport tag to control the width and scaling of the browsers viewport. Include width=device-width to match the screen's width in device independent pixels. Include initial-scale=1 to establish a 1:1 relationship between CSS pixels and device independent pixels. Media queries can be used to apply styles based on device characteristics. 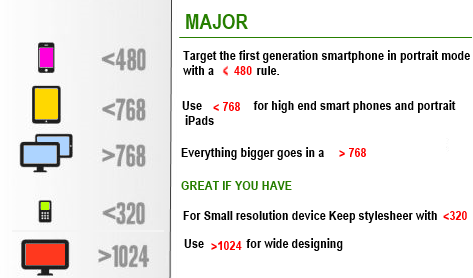 Below is a list of most popular devices, along with their resolutions and display sizes.